the progress that was achieved during the first RBMP cycle (2010-2015). The Water Framework Directive (WFD), now 18 years old, established a framework for the assessment, management, protection and improvement of the quality of water resources across the EU. This year, the European Commission will publish its report on the assessment of the second RBMPs and will start the process of evaluating the WFD. To accompany and inform this process, the EEA has produced this report on the state of Europe’s water. Of the different water bodies recognised by the Water Framework Directive (WFD) across Europe, groundwaters generally have the best status. Good chemical status has been achieved for 74% of the groundwater area, while 89% of the area achieved good quantitative status. Around 40% of surface waters (rivers, lakes and transitional and coastal waters) are in good ecological status or potential, and only 38% are in good chemical status. In most Member States, a few priority substances account for poor chemical status, the most common being mercury. If mercury and other ubiquitous priority substances were omitted, only 3% of surface water bodies would fail to achieve good chemical status. Improvements for individual substances show that Member States are making progress in tackling the sources of contamination. Overall, the second RBMPs show limited change in status, as most water bodies have the same status in both cycles. The proportion of water bodies with unknown status has decreased and confidence in status assessment has grown. Improvements are usually visible at the level of individual quality elements or pollutants but often do not translate into improved status overall. The main significant pressures on surface water bodies are hydromorphological pressures (40%), diffuse sources (38%), particularly from agriculture, and atmospheric deposition (38%), particularly of mercury, followed by point sources (18%) and water abstraction (7%). Member States have made marked efforts to improve water quality or reduce pressure on hydromorphology. Some of the measures have had an immediate effect; others will result in improvements in the longer term. It can be expected that, by the time the third RBMPs are drafted (2019-2021), some of the several thousand individual measures undertaken in the first and second RBMPs should have had a positive effect in terms of achieving good status. The report presents only the key results, while more detailed WFD results are presented in the WISE-Freshwater WFD visualisation tool. 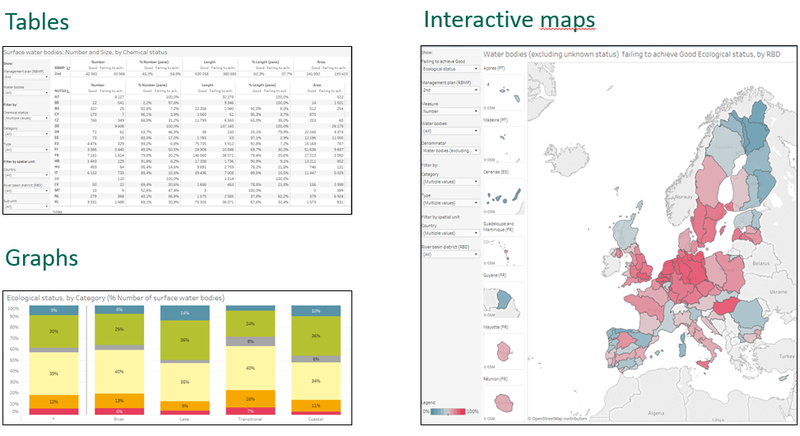 Results are presented as interactive tables, graphs and maps (“Dashboards”), and as overviews at EU, Member State and river basin districts (RBDs) levels. More than 150 “dashboards” (Web-visualisations), presenting status and pressure information, are now available online. The dashboards present the data Member States have reported via the first (in 2010-2012) and the second River Basin Management Plans (RBMPs, in 2012-2016). Caution is advised when comparing Member States and when comparing the first and second RBMPs, as the results are affected by the methods Member States have used to collect data and often cannot be compared directly. The Water Framework Directive ‘water environment’ includes rivers, lakes, transitional waters, groundwater and coastal waters out to 1 nautical mile (12 nautical miles for chemical status, i.e. for territorial waters). These waters are divided into units called water bodies. Member States have in the river basin districts delineated water bodies and reported different data to characterize water bodies such as length or area, category (groundwater, rivers, lakes, transitional, coastal waters), national type and information if a surface water body is designated as heavily modified or artificial. Ecological status is an assessment of the quality of the structure and functioning of surface water ecosystems. It shows the influence of pressures (e.g. pollution and habitat degradation) on the identified quality elements. Ecological status is determined for each of the surface water bodies of rivers, lakes, transitional waters and coastal waters, based on biological quality elements and supported by physico-chemical and hydromorphological quality elements. The overall ecological status classification for a water body is determined, according to the ‘one out, all out’ principle, by the element with the worst status out of all the biological and supporting quality elements. For surface waters, good chemical status means that no concentrations of priority substances exceed the relevant EQS established in the Environmental Quality Standards Directive 2008/105/EC (as amended by the Priority Substances Directive 2013/39/EU). EQS aim to protect the most sensitive species from direct toxicity, including predators and humans via secondary poisoning. A smaller group of priority hazardous substances were identified in the Priority Substances Directive as uPBT (ubiquitous (present, appearing or found everywhere), persistent, bioaccumulative and toxic). The uPBTs are mercury, brominated diphenyl ethers (pBDE), tributyltin and certain polyaromatic hydrocarbons (PAHs). The WFD requires Member States to designate separate groundwater bodies and ensure that each one achieves 'good chemical and quantitative status'. To meet the aim of good chemical status, hazardous substances should be prevented from entering groundwater, and the entry of all other pollutants (e.g. nitrates) should be limited. Good quantitative status can be achieved by ensuring that the available groundwater resource is not reduced by the long-term annual average rate of abstraction. In addition, impacts on surface water linked with groundwater or groundwater-dependent terrestrial ecosystems should be avoided, as should saline intrusions. The WFD requires the identification of significant pressures from point sources of pollution, diffuse sources of pollution, modifications of flow regimes through abstractions or regulation and morphological alterations, as well as any other pressures. ‘Significant’ means that the pressure contributes to an impact that may result in failing to meet the WFD objectives of not having at least good status. In some cases, the pressure from several drivers, e.g. water abstraction from agriculture and households, may in combination be significant. Ecological status is determined for rivers, lakes, and transitional and coastal waters based on biological quality elements (phytoplankton, macrophytes, phytobenthos, benthic invertebrate fauna and fish) and supporting physico-chemical (nutrients, oxygen condition, temperature, transparency, salinity and river basin specific pollutants (RBSPs) and hydromorphological quality elements. The WFD specifies which elements are to be assessed for each water category and requires that biological and supporting quality elements achieve at least good status. The dashboards provide overview of the different results related to ecological status of quality elements. Pressures and impacts The WFD requires the identification of significant pressures from point sources of pollution, diffuse sources of pollution, modifications of flow regimes through abstractions or regulation and morphological alterations, as well as any other pressures. ‘Significant’ means that the pressure contributes to an impact that may result in failing to meet the WFD objectives of not having at least good status. In some cases, the pressure from several drivers, e.g. water abstraction from agriculture and households, may in combination be significant. Further dashboards are available below. Delineation of water bodies The Water Framework Directive ‘water environment’ includes rivers, lakes, transitional waters, groundwater and coastal waters out to 1 nautical mile (12 nautical miles for chemical status, i.e. for territorial waters). These waters are divided into units called water bodies. Member States have in the river basin districts delineated water bodies and reported different data to characterize water bodies such as length or area, category (groundwater, rivers, lakes, transitional, coastal waters), national type and information if a surface water body is designated as heavily modified or artificial. More dashboards are available below the main dashboard. Chemical status of surface water bodies For surface waters, good chemical status means that no concentrations of priority substances exceed the relevant EQS established in the Environmental Quality Standards Directive 2008/105/EC (as amended by the Priority Substances Directive 2013/39/EU). EQS aim to protect the most sensitive species from direct toxicity, including predators and humans via secondary poisoning. A smaller group of priority hazardous substances were identified in the Priority Substances Directive as uPBT (ubiquitous (present, appearing or found everywhere), persistent, bioaccumulative and toxic). The uPBTs are mercury, brominated diphenyl ethers (pBDE), tributyltin and certain polyaromatic hydrocarbons (PAHs). Click on <..> to see different dashboards, more dashboards are available below the main dashboard. Quality element status Ecological status is determined for rivers, lakes, and transitional and coastal waters based on biological quality elements (phytoplankton, macrophytes, phytobenthos, benthic invertebrate fauna and fish) and supporting physico-chemical (nutrients, oxygen condition, temperature, transparency, salinity and river basin specific pollutants (RBSPs) and hydromorphological quality elements. The WFD specifies which elements are to be assessed for each water category and requires that biological and supporting quality elements achieve at least good status. The dashboards provide overview of the different results related to ecological status of quality elements. Further dashboards are available below. Ecological status of surface water bodies Ecological status is an assessment of the quality of the structure and functioning of surface water ecosystems. It shows the influence of pressures (e.g. pollution and habitat degradation) on the identified quality elements. Ecological status is determined for each of the surface water bodies of rivers, lakes, transitional waters and coastal waters, based on biological quality elements and supported by physico-chemical and hydromorphological quality elements. The overall ecological status classification for a water body is determined, according to the ‘one out, all out’ principle, by the element with the worst status out of all the biological and supporting quality elements. More dashboards are available below the main dashboard. Groundwater quantitative and chemical status The WFD requires Member States to designate separate groundwater bodies and ensure that each one achieves 'good chemical and quantitative status'. To meet the aim of good chemical status, hazardous substances should be prevented from entering groundwater, and the entry of all other pollutants (e.g. nitrates) should be limited. Good quantitative status can be achieved by ensuring that the available groundwater resource is not reduced by the long-term annual average rate of abstraction. In addition, impacts on surface water linked with groundwater or groundwater-dependent terrestrial ecosystems should be avoided, as should saline intrusions. Further dashboards are available below. European waters getting cleaner, but big challenges remain Despite progress in improving the quality of Europe’s lakes, rivers, coastal waters and groundwater sources, pollution, structures like dams, and over-abstraction remain top threats to their long-term health. A vast majority of Europe’s water bodies still fail to meet the European Union’s minimum target for ‘good status’, according to a European Environment Agency ‘state of water’ report published today. WISE WFD Database (Water Framework Directive Database) The WISE WFD database contains data from the 1st and 2nd River Basin Management Plans reported by EU Members States according to article 13 of the Water Framework Directive (WFD). The database includes information about surface water bodies (number and size, water body category, ecological status or potential, chemical status, significant pressures and impacts) and about groundwater bodies (number and size, quantitative status, chemical status, significant pressures and impacts). The information is presented by country, river basin district (RBD) and river basin district sub-unit (where applicable). European waters -- Assessment of status and pressures 2018 The main aim of EU water policy is to ensure that a sufficient quantity of good-quality water is available for both people's needs and the environment. The Water Framework Directive (WFD), which came into force in 2000, established a framework for the assessment, management, protection and improvement of the quality of water resources across the EU. Since December 2015, EU Member States have been publishing the second river basin management plans (RBMPs) for achieving the environmental objectives of the WFD. These plans are updates of the first RBMPs, which were published in 2009. For references, please go to https://www.eea.europa.eu/themes/water/european-waters/water-quality-and-water-assessment/water-assessments/eea-2018-water-assessment or scan the QR code.